3 Important Concepts: - Association, Aggregation and Composition. In this article we will try to understand 3 important concepts association, aggregation and composition. We will also try to understand in what kind of scenarios do we need them. These 3 concepts have really confused lots of developers and in this article my attempt would be to present the concepts in a simplified manner with some real world examples. Manager is anemployee of XYZ limited corporation. Manager uses a swipe card to enter XYZ premises. Manager has workers who work under him. Manager has the responsibility of ensuring that the project is successful. Manager's salary will be judged based on project success. If you see the first requirement (Manager is an employee of XYZ limited corporation) it’s a parent child relationship or inheritance relationship. The sentence above specifies that Manager is a type of employee, in other words we will have two classes one the parent class “Employee” and the other a child class “Manager” which will inherit from “Employee” class. Note: -The scope of this article is only limited to aggregation, association and composition. So we will not discuss inheritancein this article as its pretty straight forward and I am sure you can get1000 of articles on the net which will help you in understanding the same. The requirement 2 is an interesting requirement (Manager uses a swipe card to enter XYZ premises). In this requirement the manager object and swipe card object use each other but they have their own object life time. In other words they can exist without each other. The most important point in this relationship is that there is no single owner. 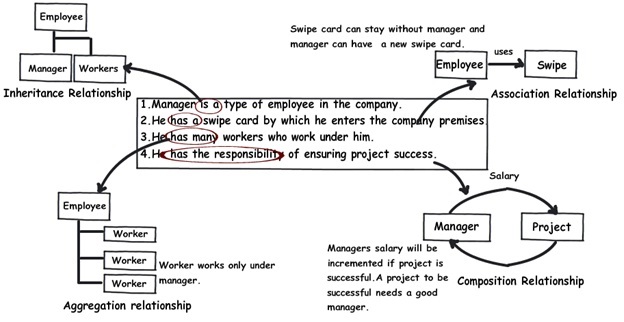 The above diagram shows howthe “SwipeCard” class uses the “Manager” class and the “Manager” class uses the “SwipeCard” class. You can also see how we can create the object of the “Manager” class and “SwipeCard” independently and they can have their own object life time. This relationship is called as the “Association” relationship. The third requirement from our list (Manager has workers who work under him) denotes the same type ofrelationship like association but with a difference that one of them is an owner. So as per the requirement the “Manager” object will own “Workers” object. The child “Worker” objects can not belong to any other objects. 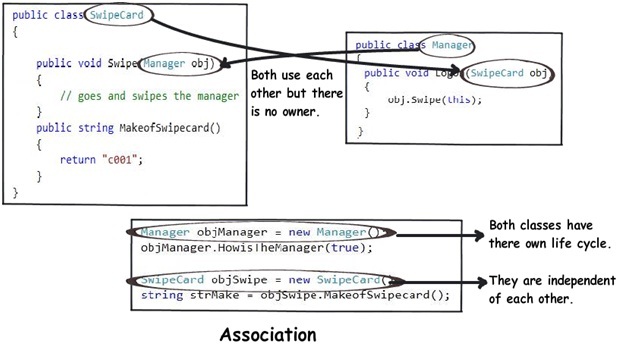 For instance the “Worker” object cannot belong to the “SwipeCard” object. But But….the “Worker” object can have his own life time which is completely disconnected from the “Manager” object. Looking from a different perspective it means that if the “Manager” object is deleted the “Worker” object does not die. This relationship is termed as the “Aggregation” relationship. Manager and the project objects are dependent on each other. The lifetimes of both the objects are same. In other words the project will not be successful if the manager is not good and manager will not get good increments if project has issues. Below is how the class formation will look like. You can also see when I go to create the project object it needs the manager object. This relationship is termed as the composition relationship. In this relationship both objects are heavily dependent on each other. In other words if goes for garbage collection the other also has to garbage collected , or putting from a different perspective the life time of the objects are same. That’s why I have put in the heading “Death” relationship. Below is a visual representation of how the relationships have emerged from the requirements. To avoid confusion hence forth in these 3 terms I have put forward a table below which will help us compare them from 3 angles owner , life time and child object. Child object No Child objects all are independent Child objects belong to single parent. Child objects belong to single parent. I have also added a video in case you do not want to read this long article. 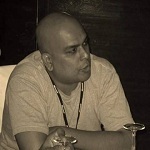 Just a note I have recorded around 500 videos, do have once a look at my videos on .NET, OOP, SQL Server, WCF, Silver light , LINQ , VSTS, Share Point, Design patterns , UML and lot more.